The Taoiseach, to the surprise of absolutely nobody at all, was running late for the launch of his party's 'Standing Up for Rural Ireland' campaign in Slane. But the hiatus did give those waiting for his arrival into the village an opportunity to witness the noisy procession of traffic which rumbles endlessly down the Main Street. Slane is a pretty spot which is in the process of picking itself off the floor. Ten new businesses have been set up in the past three years - the Conyngham Arms Hotel, which was the venue for yesterday's launch, reopened in 2012 after a total overhaul. But dear oh dear, the traffic is wojus. Lurries the size of football stadiums roar past in numbers, as do cars, trucks and tractors. For Slane is a bit of both worlds, being in a rural setting, but also situated just a short commute to the capital city. Enda was on a tight schedule as, after the Slane event, he was heading up to Glenties in Donegal to speak at the MacGill summer school and so local Meath TD Helen McEntee had a plan all worked out. She would steer the Taoiseach straight through the room without stopping where all the local businesses had set up tables to showcase their wares. Helen explained that everyone had promised not to detain him on his way through the room to the courtyard for the official part of the event. 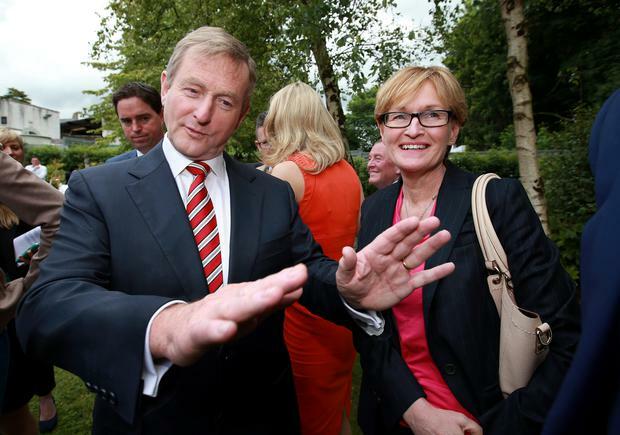 Good luck with that, Helen, thought every veteran of being on the road with Enda. The locals weren't the problem, it's the Taoiseach who is congenitally incapable of passing by a group without shaking hands. And thus, inevitably, it came to pass. The Taoiseach swept in amid a melee of cameras, photographers, TDs - Meath's Ray Butler and Regina Doherty and Kildare's Martin Heydon and also MEP Mairead McGuiness - and promptly headed with hand outstretched towards the nearest group in the room. "Doesn't this feel like an election?" muttered one observer uneasily. It certainly did. Even the theme of the launch had an election-y vibe about it, given that it's aimed at the large swath of the electorate that doesn't reside in Dublin or other cities. And the Taoiseach was keen to stress that the Government had all sorts of plans for rural Ireland. He admitted that broadband - or the lamentable absence of it in many parts of the land - "is an issue", adding that the Government tendering process to roll it out to all corners over the next few years would shortly be under way. And he also muttered something vaguely comforting about the bypass. There was also some talk about the progress of a combined technology college in the West. Hmm, was that the rumble of a passing truck, or the rumble of an approaching election?